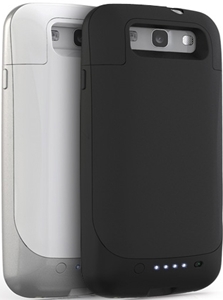 The flagship Smartphone of Samsung, Samsung Galaxy S 3 has now got a battery extender. Now those who are not comfortable with the battery life of their Galaxy S3 Mophie Juice Pack have just arrived to their rescue. This is actually a thin case which stocks a rechargeable battery that virtually increases your battery time. So now there is no need to compromise on any feature of Galaxy S3 and what’s amusing is that the juice pack even doesn’t affect the NFC and S Beam capability of Galaxy S3 to keep sharing through touch. A standby switch allows user to charge whenever needs, there are four LED light indicators on the back side of juice pack that indicates how much charge is left in the juice pack. 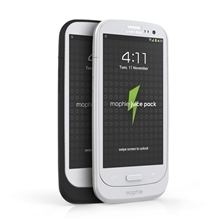 Juice pack is available in two colors White and Black while its Price is just $99.